(The list of colleges is at the end of the post.) Of the three NCAA divisions, D2 is the smallest for softball. The advantage of playing at a D2 college is that they still offer scholarships unlike D3 schools. While the number of scholarships may be fewer than those in D1, D2 softball college programs will likely have less intense demands on players’ time than D1 schools. This means players may be able to consider doing something else other than playing softball and attending class while in college. D2 is the smallest NCAA division in softball with 288 programs. However, in 19 states there are more D2 programs than D1 and D2 softball colleges outnumber D3 programs in 22 states. Pennsylvania has the most D2 Softball colleges with 22. North Carolina follows with 20 and California is third with 17. There are 13 states with 10 or more D2 softball colleges. Six states don’t have any and seven have only 1. Softball is an equivalency sport for scholarships which means that one scholarship may be split among several players. D2 softball colleges are allowed a maximum of 7.2 scholarships per team. CSS provides a breakdown by position on how coaches use scholarships in recruiting. You can see a difference in D1 and D2 player characteristics and skill level expectations at AthNet. According to the Office of Postsecondary Education (OPE), 34 D2 softball colleges have operating expenses of $100,000 or more. Western Oregon had the highest at $155,954, Cal State Monterey Bay was next at $151,709, and Dixie State was third with $150,807. A total of 23 colleges had team operating expenses of less than $20,000. The average for all teams was $63,676. The Great Northwest Athletic Conference had the highest average team operating expenses of $112,596. The California Collegiate Athletic Association was second and the Pacific West Conference came in a close third. The conferences with the lowest averages were the Central Intercollegiate Athletic Association, the Southern Intercollegiate Athletic Conference, and the Central Atlantic Collegiate Conference. The following data is from the OPE using the Equity in Athletics Data Analysis Cutting Tool. The information is from 2016 so the division and conference may not be current for schools. 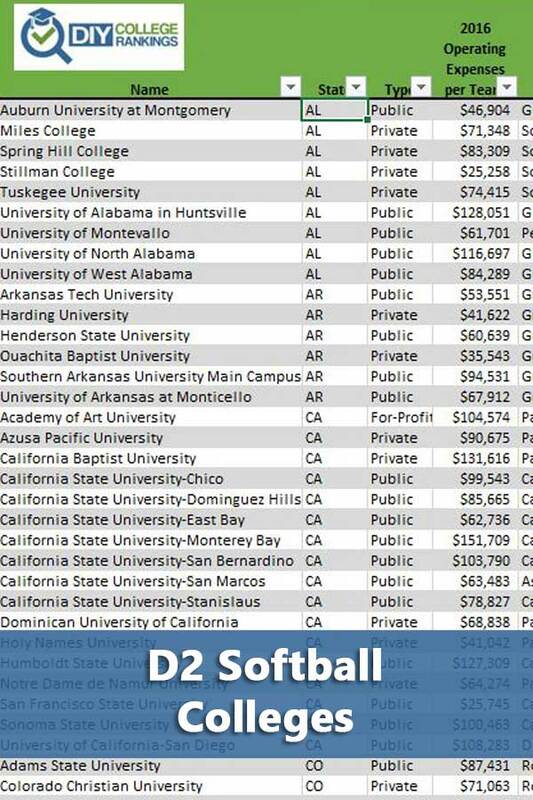 Check with the NCAA for the most recent listing of D2 softball programs. All of this data can be found in the DIY College Rankings Softball Spreadsheet.